According to a recent study by Bankrate, most Americans are drastically unprepared when it comes to emergencies. Only 39 percent of respondents claimed to have enough money in savings to cover an unexpected $1,000 expense. You can protect yourself from tragedy by starting an emergency fund today. It takes less than five minutes to set one up, and the practice of stocking your emergency fund can ensure you are always financially protected, even in the worst of situations. Here's everything you need to know about emergency funds and how to set one up in five minutes or less. When disaster strikes, will you be ready for it? An emergency fund can protect you. 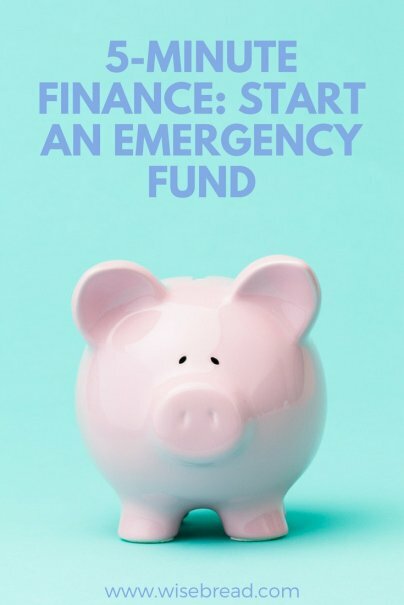 In short, an emergency fund is money set aside specifically for emergencies or unexpected expenses you wouldn't have budgeted for otherwise. For instance, a medical bill, job loss, or major car repair could be considered an emergency expense. Instead of dipping deep into savings or putting an emergency on a credit card, with an emergency fund, you are already prepared with cash in hand in the event of an unexpected, urgent cost. There is no set amount that constitutes the perfect sized emergency fund, though many finance experts agree you should strive to save between three and six months' worth of regular living expenses. By starting an emergency fund, you are protecting yourself and your family from disaster and/or debt. If an emergency situation arises, you know you will always have the means to pay for the service or good you need. The last thing you want to be worried about is money. Failing to have an emergency fund can come with a big cost. Many people, having no other options, put the expense on credit cards, which can take years to pay off. Others try to file for a hardship withdrawal from their employer-sponsored 401(k), which has major tax implications. In the most dire of cases, people even file for bankruptcy. If they would have just built up an emergency fund, many of these cases could have been prevented. It only takes a few minutes to start your own emergency fund. Simply open up a new savings account and deposit whatever money you can. Keep in mind, it's a good idea to keep your emergency fund separate from your regular savings account so you lessen the temptation to spend the money on everyday items. After you have started to save money, leave the cash alone. It may be tempting to spend the money on a more immediate expense, but remember, this money should be socked away for true emergencies only. To build your emergency fund more quickly, you can enroll in an automatic savings plan, which is an option at most banks. With this plan, you can choose to have money automatically deducted from your regular savings or checking account and put straight into your emergency savings. Automatic savings plans are a great option for anyone who may be tempted to spend the money otherwise, or who likes to automate their finances as much as possible.